Uncategories What would it take for the Ontario election to be competitive? What would it take for the Ontario election to be competitive? Let's face it, as it stands, the Ontario election isn't a nail biting contest. If the election was tomorrow, anything but a Doug Ford victory would be a monumental surprise. Here below are my most updated projections to illustrate my point. Not much is changed since yesterday except that I now include the daily Mainstreet tracker (but I will obviously not reveal the actual numbers. Consider subscribing if you are interested. For $30, you'll get daily new numbers on their site). I have also fixed some small typos and mistakes that people have noticed). The riding by riding projections are available at the bottom of this post. So, how far are we from a competitive election? The answer is actually closer than what you think. Or what the projections above might make you believe. See, the projections and probabilities aren't telling you the odds that the situation will change. It's telling the odds for today, based on the information available. So when I say the PC has a 99% chance of winning, this is if the election was tomorrow. The way you should interpret it is that currently, the only way for the Tories to lose would be for the polls to be incredibly off. But things will likely change between now and June 7th. Scandals, debates, attacks, etc. All of these will likely change the opinion of some voters. Who are those voters who could change and, if they do change, would it make the race more competitive? Let's look at them. Based on the (very long and detailed) Innovative poll, it is clear that PC voters are the least likely to change their mind. On the other hand, NDP and Liberals show less certainty with their current choice. Specifically, almost a majority of OLP voters -48%- are actually likely to switch! Mainstreet shows similar numbers, at least qualitatively speaking. The NDP also has the particularity to be the main 2nd choice of both Liberals and Conservative voters. Bottom line, there are mostly two groups of voters that could still change: Some OLP-NDP swing voters (the bigger group) and some PC-NDP swing voters. Here below is the graph from the Innovative poll. For the former, there is a key sub-group that consists essentially of people who want change but still think the Ontario Liberals are the best to form the government. This is a key group Andrea Horwath needs to convince to switch. So, how many of these voters need to actually switch for the NDP to have a chance? Let's play with the numbers. Both Mainstreet and Innovative agree that about 50% of the Liberals have the NDP as second choice (and 15% for the PC). And both pollsters agree that about half of them are likely to change. Let's be a little bit conservative and assume that 30% of Liberals voters will switch. That would leave this party with about 17% of the votes. This is a little bit more than how many are defined as the "core ON Liberals" (people who don't think it's time for change and like the current government, so these voters will not change their vote). It does mean most of the "time for change but think OLP is best" group would switch however. The NDP would receive 75%*30% of the OLP voters (the 75% is around 50%/(50%+15%) because 50% of OLP voters have the NDP as second choice and 15% have the PC. 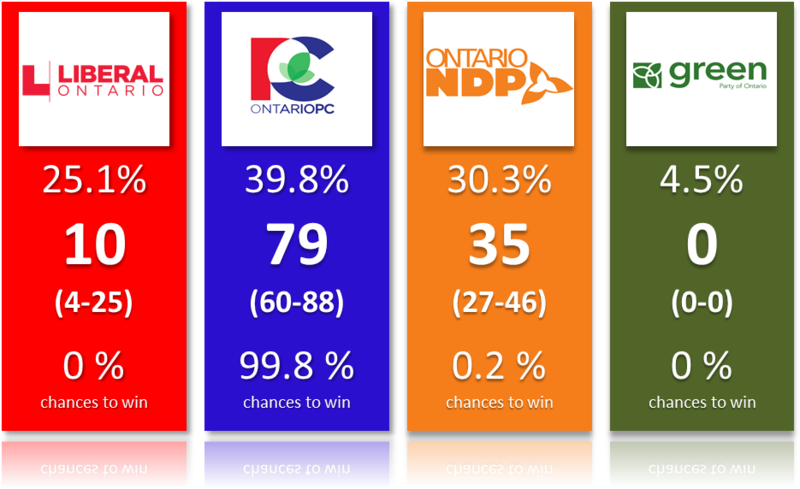 I'm assuming here no OLP voters would switch to not voting, so I need to normalize), thus around 5.5 points. The PC would receive some votes (as some OLP voters do have the PC as second choice), around 1.5 points. That still isn't a competitive race. The PC would still be favourite. But the dynamic and coverage of the race could be very different. The NDP could now be seen as a real challenger, something that isn't fully the case for everyone right now. And this could mean that some people who hate the Liberals and really want change but are currently voting PC (seen as the best way to get rid of Wynne) could change their mind. Call it a bandwagon effect. What if 50% of Liberals voters switch instead? If we assume that the Liberals would only lose voters to the NDP, then it'd be PC at 40% and NDP at 38.5%, a very close election. So here you have it, assuming the PC voters won't change opinion easily (and evidence indicates that much), in order for this race to be competitive, we need basically one third of Liberals voters to switch. We need the Liberals to fall to their absolute base or core. Anyone who doesn't think this government has been doing a great job and it's time for change needs to vote something else than OLP. Is it likely? Well, when asked, Liberals voters say there is a 50% chance they will change their mind. Can we interpret that as there is a 50% chance we will have a competitive by the end of the campaign? I think this is pushing it. I think many people always overestimate their likelihood to change. But it's definitely far from impossible. And let's remember that there are other scenarios that lead to a competitive race (instead of only Liberals voters switching to the NDP, we can have a mix of Liberals and PC voters). The only real difficulty in having a competitive race is the fact the PC is at 40% and its vote appears to be solid. It's hard to get two parties around 40% as it requires the third one to collapse. My guess? Well I'm terrible at guesses usually but I believe the Liberals will likely keep dropping in the next 1-2 weeks and NDP will keep increasing. 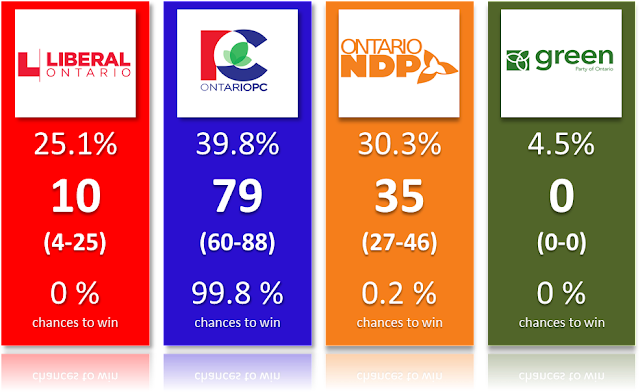 We will get to a point where we'll be talking about the possibility of a competitive race (think PC at 39% and NDP at 33%). After that, no idea if the trend will continue or not. it'll depend on many factors. I'll say this: it doesn't take a crazy scenario or insane assumptions for this race to be competitive. A fairly straightforward reading and application of the 2nd choices and chances to change their mind actually leads to it.